2. The highest quality, lowest price and most pupular style. 3. Welcome any OEM order according to your requirements. 3. Nominal impedance: 8 Ohm. 4. 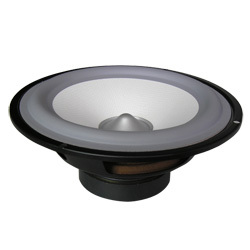 Rated capacity: 20 watts rms. 5. Sensitivity (1M, 1W): 83 db. 6. Actual periodicity：48Hz - 4K Hz. 7. Min. sympathetic vibration periodicity：48 Hz. 8. Drum membrane material: P.U + paper. 9. Voice coil diameter：1 in ( 25.5mm). 10. Voice coil structure material：ASV. 11. Magnet weight：265.4G( 9.36 OZ).